With over 1 billion downloads on the Play Store alone, Google Maps has become a staple for those traveling. Its popularity is the result of Google consistently improving its accuracy and adding new functionality. And this was only achieved with help of you — specifically, your data. Your data is the backbone of Google Maps' continued growth. With millions of users on both mobile platforms, Google has access to a large collection of location data which it analyzes. This helps Google Maps represent the real world accurately so that future commuters get to where they need to go quickly and safely. This data has also allowed Maps to evolve into more than just a navigation tool — it's now virtually the only app you need when taking a long trip. Obviously, Google Maps uses your data to offer turn-by-turn directions. For accurate navigation, Maps requests access to the GPS sensor, which it uses to locate you and adjust your route accordingly. In addition to turn-by-turn direction for drivers, Google Maps offer directions for a host of other means of travel. Whether you using the train, bus, walking, or cycling, Google Maps is able to accurately navigate you to your location based on your means of travel. For each means of travel, Maps also let you fine-tune controls, eliminating specific types of paths. For example, drivers can ask for a route that avoids highways, toll roads, or ferries, or all three. 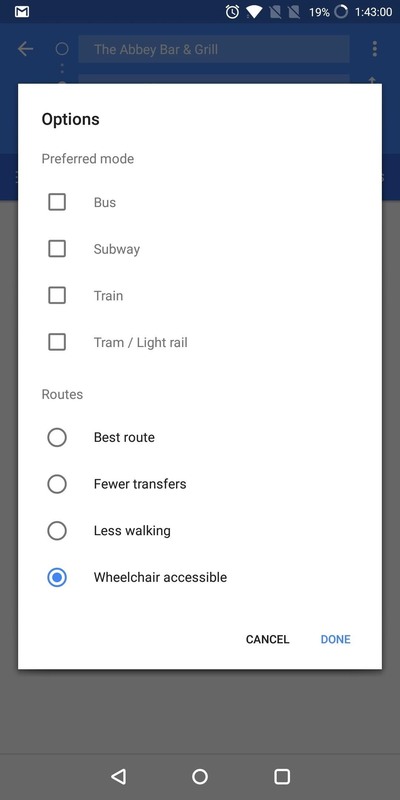 They even recently added the ability to ensure the route is wheelchair accessible for those traveling via bus or train. Accommodating for all these different methods of travel requires a large dataset. Thanks to Google's collection of location data from its customers, it is able to update its current offering and add new routes to accommodate all walks of life. 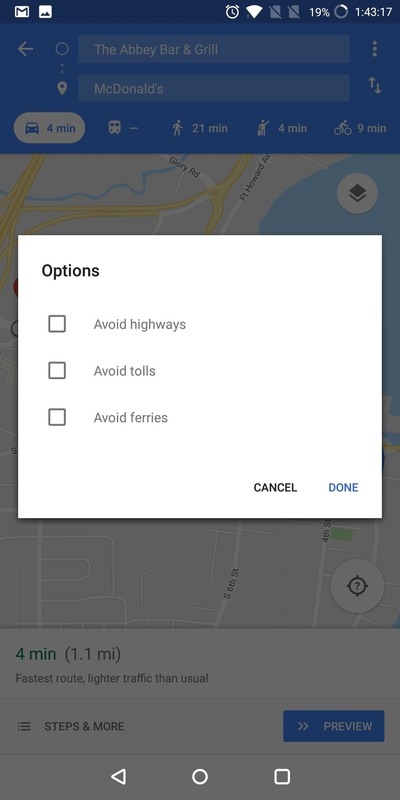 Google Maps also uses your phone's location data to determine current traffic on roads. As you drive along, Google anonymously logs your location along with all the other Maps users on the road with you. By periodically pinging your location, it can determine how fast you moved between two points and "see" your speed of travel. By doing this with all active Maps users, Google gets a clear picture of how fast or slow traffic is moving on certain routes. With this info, Google Maps can provide accurate commute times that are updated continuously. 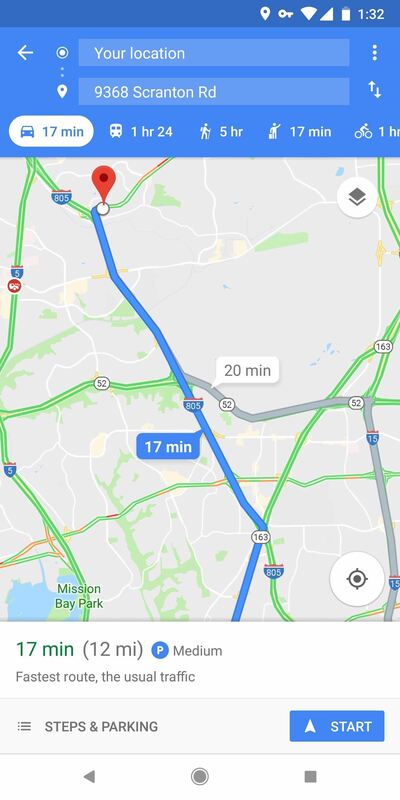 When you search for direction to a location, Google uses the traffic information collected for all potential routes, recommends the fastest option, and can provide an almost precise time of your arrival. Additionally, when you enter Navigation Mode, a live commute time will be displayed that will update based on a detour you took and traffic changes in the area. Using anonymized data from users who enable Location History, Google Maps determines the popular times of businesses, such as restaurants, to help future customers avoid the rush. 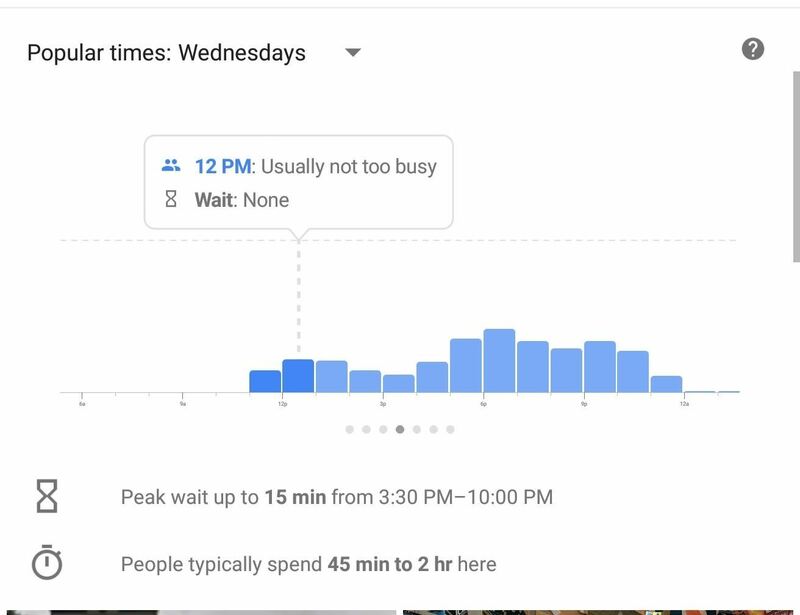 For each hour of operation, Maps will display an estimated amount of customers who typically arrive during that time and day (represented by a bar graph). Selecting individual hours will provide more information including wait time and a description of the what the wait time translate to (for example, if an hour wait is normal or busy). When selecting the bar associated with the current time, this text will switch to a Live look, providing a real-time estimate of current traffic. 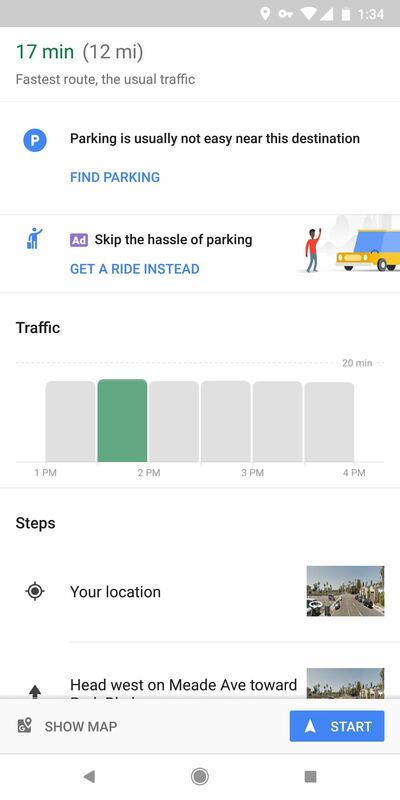 Google Maps will also use the data it gathers from current customers who attend the establishment to estimate that average duration customers spend inside. 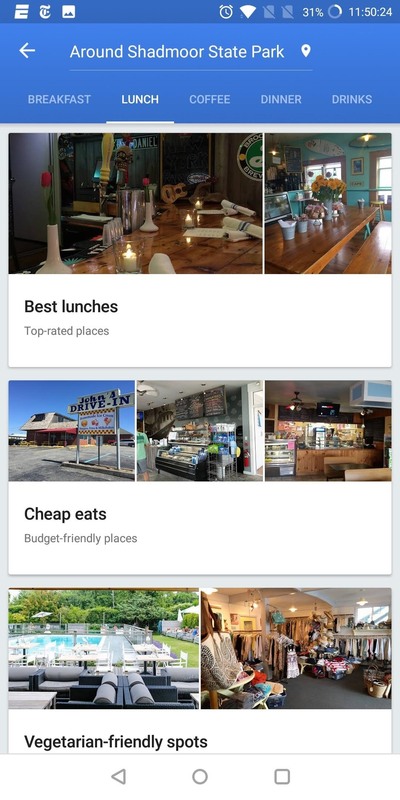 Google Maps allow users to use their camera to take photos and videos of local establishments and areas. These images and videos can then be uploaded to Google Maps and added to a business's official page. Similar to Yelp, Maps relies on user input to create a complete visual display of the business. These photos assist the business by providing new customers a preemptive glance at what the business and the products they sell look like. Borrowing from a previous app, Google Latitude, Google Maps allows you to share your real-time location with a select group of people of your choosing. Using the "Location Sharing" option, you can share your location for a designated amount of time. 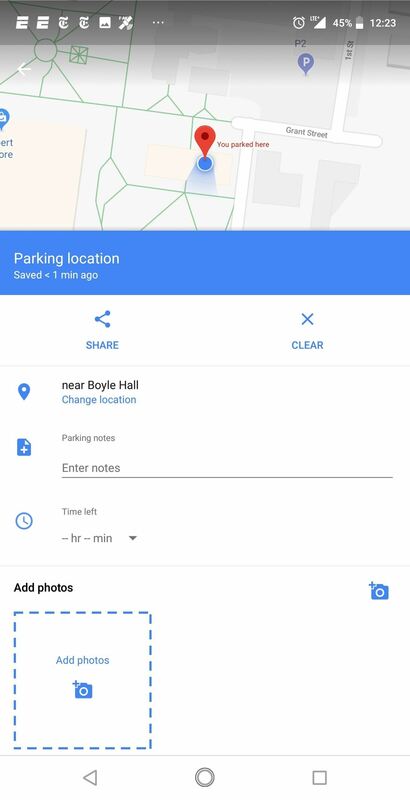 This feature is useful if you are lost and not sure of your current whereabouts or want your friends (or strangers) to meet you at a cool new location. Using your location, Google Maps recommends local places and business that might interest you that are in your area. 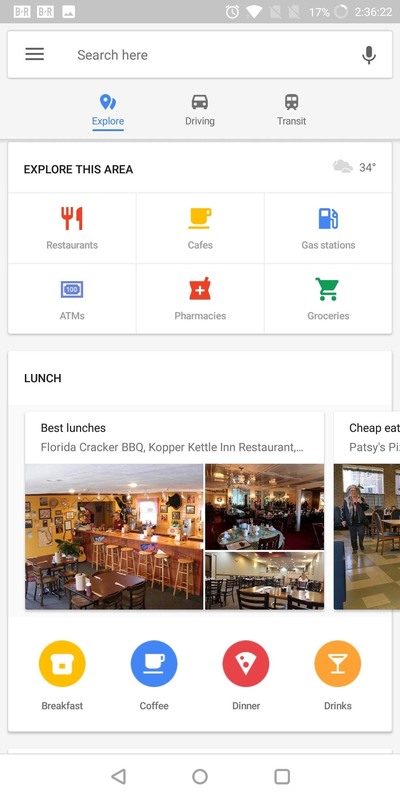 Under the "Explore" option, users can swipe through an array of tabs that categorize restaurants and other establishments based on the type of meal offering (for example, breakfast, lunch, and dinner). Furthermore, there's an "Explore" tab along the bottom of the main display which you can use to find various other local businesses besides restaurants. There is an option for groceries, pharmacies, ATMs, and gas stations. For businesses that don't fit those categories, you can use the search bar along the top of the main page. 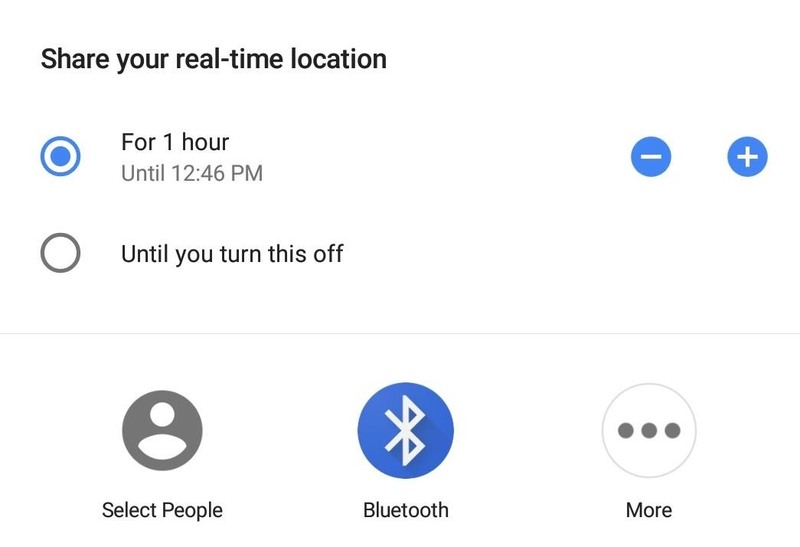 Using your location data, Google Maps can automatically determine the location of your home and workplace based on the frequency of your travel to those locations, how much time you spend there, and the time of day you visit. With this designation, navigating to these areas is easier, as you are no longer required to type the address. Instead, you can simply type "home" or "work" and your address will show up. You can also manually input their location if you don't wish to wait for Maps to figure it out. Thanks to Google Maps integration with Google Contacts, navigating to your friends' homes is even easier. 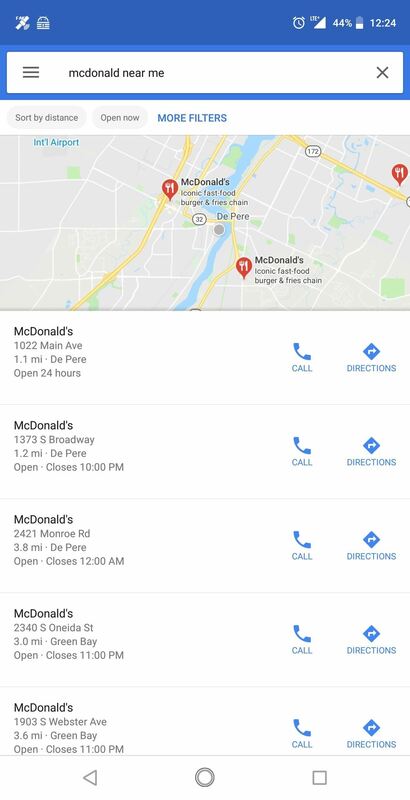 Google Maps can read addresses inputted in Contacts and add their name as a searchable term in Google Maps' search bar. Therefore, instead of inputting their address, you can simply type "Daniel" to navigate to the address associated with Daniel's contact card on your phone. 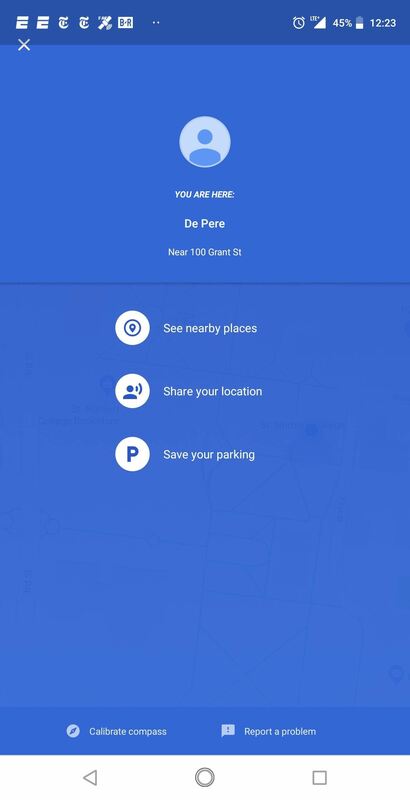 After finding a difficult parking spot, Google Maps allows you to save its location to Maps using your GPS sensor. Additionally, you can add notes which can further assist you if the GPS sensor is obstructed thanks to nearby buildings. With access to its customers' data, Google Maps has become the go-to maps application on both mobile OSes. Thanks to location data it collects each day, Maps has expanded its offering and improved its ability to provide accurate navigation no matter where you are or how you want to travel.